Nematian, J., Musavi, M. (2016). Uncapacitated phub center problem under uncertainty. Journal of Industrial and Systems Engineering, 9(special issue on location allocation and hub modeling), 23-39. Javad Nematian; M.Mohammad Musavi. "Uncapacitated phub center problem under uncertainty". 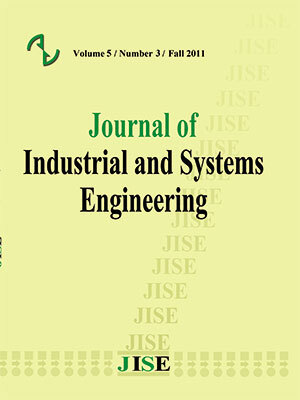 Journal of Industrial and Systems Engineering, 9, special issue on location allocation and hub modeling, 2016, 23-39. Nematian, J., Musavi, M. (2016). 'Uncapacitated phub center problem under uncertainty', Journal of Industrial and Systems Engineering, 9(special issue on location allocation and hub modeling), pp. 23-39. Nematian, J., Musavi, M. Uncapacitated phub center problem under uncertainty. Journal of Industrial and Systems Engineering, 2016; 9(special issue on location allocation and hub modeling): 23-39. Hubs are facilities to collect arrange and distribute commodities in telecommunication networks, cargo delivery systems, etc. In this paper, an uncapacitated phub center problem in case of single allocation and also multiple allocation will be introduced in which travel times or transportation costs are considered as fuzzy parameters. Then, by proposing new methods, the presented problem is converted to deterministic mixed integer programming (MIP) problems where these methods will be obtained through the implementation of the possibility theory and fuzzy chance-constrained programming. Both possibility and necessity measures are considered separately in the proposed new methods. Finally, the proposed methods are applied on the popular CAB data set. The computational results of our study show that these methods can be implemented for the phub center problem with uncertain frameworks. Alumur, S. A., Nickel, S., & Saldanha-da-Gama, F. (2012). Hub location under uncertainty. Transportation Research Part B: Methodological, 46(4), 529-543. Bashiri, M., Mirzaei, M., & Randall, M. (2013). Modeling fuzzy capacitated p-hub center problem and a genetic algorithm solution. Applied Mathematical Modelling, 37(5), 3513-3525. Boukani, F. H., Moghaddam, B. F., & Pishvaee, M. S. 2014. Robust optimization approach to capacitated single and multiple allocation hub location problems. Computational and Applied Mathematics, 1-16. Campbell, J. F., & O'Kelly, M. E. 2012. Twenty-five years of hub location research. Transportation Science, 46(2), 153-169. Campbell, J.F., 1994. Integer programming formulations of discrete hub location problems. European Journal of Operational Research 72 (2), 387–405. Dubois, D. and Prade, H., 2001. Possibility theory, probability theory and multiple-valued logics: A clarification. Annals of mathematics and Artificial Intelligence, 32(1-4), 35-66. Ernst, A.T., Hamacher, H., Jiang, H., Krishnamoorthy, M., Woeginger, G., 2009. Uncapacitated single and multi-allocation p-hub center problems. Computers and Operations Research 36 (7), 2230–2241. Niakan, F., Vahdani, B., & Mohammadi, M. 2014. A multi-objective optimization model for hub network design under uncertainty: An inexact rough-interval fuzzy approach. Engineering Optimization, (ahead-of-print), 1-19. Farahani, R. Z., Hekmatfar, M., Arabani, A. B., & Nikbakhsh, E. 2013. Hub location problems: A review of models, classification, solution techniques, and applications. Computers & Industrial Engineering, 64(4), 1096-1109. Ghaderi, A., & Rahmaniani, R. 2015. Meta-heuristic solution approaches for robust single allocation p-hub median problem with stochastic demands and travel times. The International Journal of Advanced Manufacturing Technology, 1-21. Ghaffari-Nasab, N., Ghazanfari, M., & Teimoury, E. 2015. Robust optimization approach to the design of hub-and-spoke networks. The International Journal of Advanced Manufacturing Technology, 76(5-8), 1091-1110. Ghodratnama, A., Tavakkoli-Moghaddam, R., & Azaron, A. 2013. A fuzzy possibilistic bi-objective hub covering problem considering production facilities, time horizons and transporter vehicles. The International Journal of Advanced Manufacturing Technology, 66(1-4), 187-206. Kara, B.Y., Tansel, B.C., 2000. On the single assignment p-hub center problem. European Journal of Operational Research 125 (3), 648–655. Kratica, J. and Stanimirović, Z., 2006. Solving the uncapacitated multiple allocation p-hub center problem by genetic algorithm. Asia-Pacific Journal of Operational Research, 23(04), pp.425-437. Mahdi, B., & Masoud, M. (2008). Hybrid fuzzy capacitated hub center allocation problem with both qualitative and quantitative variables. World Applied Sciences Journal, 5(4), 507-516. Makui, A., Rostami, M., Jahani, E., & Nikui, A. (2002). A multi-objective robust optimization model for the capacitated P-hub location problem under uncertainty. Management Science Letters, 2(2), 525-534. Martins de Sá, E., Contreras, I., Cordeau, J.F., Saraiva de Camargo, R. and de Miranda, G., 2015. The hub line location problem. Transportation Science. Mohammadi, M., Torabi, S. A., & Tavakkoli-Moghaddam, R. 2014. Sustainable hub location under mixed uncertainty. Transportation Research Part E: Logistics and Transportation Review, 62, 89-115. Mohammadi, M. and Tavakkoli-Moghaddam, R., 2015. Design of a fuzzy bi-objective reliable p-hub center problem. Journal of Intelligent & Fuzzy Systems, (Preprint), pp.1-18. Nematian, J. 2015. A fuzzy robust linear programming problem with hybrid variables. International Journal of Industrial and Systems Engineering, 19(4), 515-546. O’Kelly, M. E. 1987. A quadratic integer program for the location of interacting hub facilities. European Journal of Operational Research, 32, 393–404. Shahabi, M., & Unnikrishnan, A. 2014. Robust hub network design problem.Transportation Research Part E: Logistics and Transportation Review, 70, 356-373. Qin, Z., & Gao, Y. 2014. Uncapacitated p-hub location problem with fixed costs and uncertain flows. Journal of Intelligent Manufacturing, 1-12. Zade, A. E., Sadegheih, A., & Lotfi, M. M. 2014. A modified NSGA-II solution for a new multi-objective hub maximal covering problem under uncertain shipments. Journal of Industrial Engineering International, 10(4), 185-197.